Shivputra Siddharamayya Komkali was born in a village in Belgaum, Karnataka. When he was just six, the title Kumar Gandharva was bestowed upon him. This unschooled prodigy could imitate most leading vocalists of north Indian music flawlessly at the age of twelve Sensing the potential of the child musicologist. Prof B. R. Deodhar took kin, under his wing. Tuberculosis struck early and his convalescence in the balmy town of Devas exposed Kumar Gandharva to Malwi folk music. The classical training and folk sensibility c resulted in a body of Dhun-Ugam or folk -based ragas. An iconoclast, he broke free from the shackles of Gharanas and developed a style of his own which was an amalgam of the most beautiful elements of north India;, music. Some called him a rebel, some hailed him as a prodigy, but his music never failed to attract attention. A classicist, an innovator, a cerebral musician, Kumar Gandharva was a music impresario par excellence. His stage presentations like’ Ceet Hemant’, ‘Geet Varsha’, ‘Geet Vasant’, ‘Triveni’, Riluraj Mehfil’, Rang Darshan Male’ won appreciation from music lovers. His critics too were silenced after his series of tributes to Marathi singer-actor Bal Gandharva, and saint poets Surdas and Tulsidas. With the passing away in 1992 of Kumar Gandharva, the stormy petrel of North Indian music tradition, the era of raging controversies and long drazon debates about musk and musical tradition came to on end. 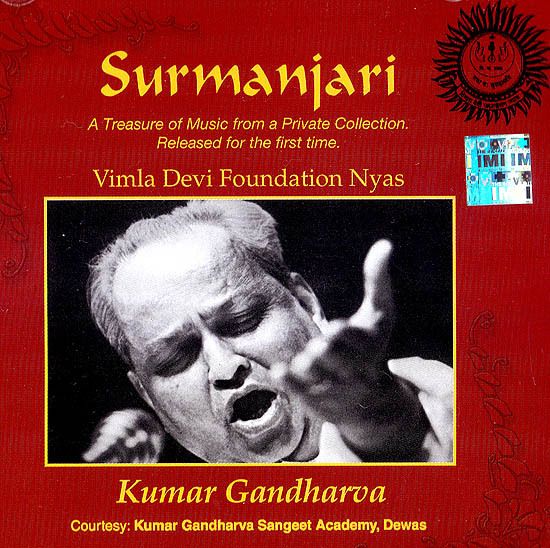 This Sur Manjari collection of the music of Kumar Gandharva is brought to you by Vimla Devi Foundation Nyas. We are grateful to Smt. Vasundhara Koinkali, Trustee, Kinnar Gandharva Sangeet Academy, Dewas, for providing this rare recording from her private collection. Vimla Devi foundation Nyas Ayodhya has been established in the pious memory of the late Rajkumari Vimla Devi of Ayodhya by her grandson Yatindra Mishra on December 13, 1999. The Princess was a talented Semi classical and Awadhi folk singer. She was very keen to promote all forms of music to bring to the fore the cultural panorama of India. This foundation aims at working for reinvigoration and preservation of India Culture philosophy Arts, Literature and Music, with these objects in view the foundation organizes a series of music programmes every year and awards Vimla Devi Shamman to the maestros for their contribution. As a new step in this direction the foundation has come out with some Landmark recordings of live concerts. It will be a matter of great satisfaction for the foundation to provide the world of music with the rare repertoire. The titles released under the various classical brands of Virgin are Shruti Sadolikar on Swar Shikkar Sulochana Brahaspati on Swar Shodh Gangubai Hangal on Swar Shodh and Sunanda Sharma on Swar Sanchay.